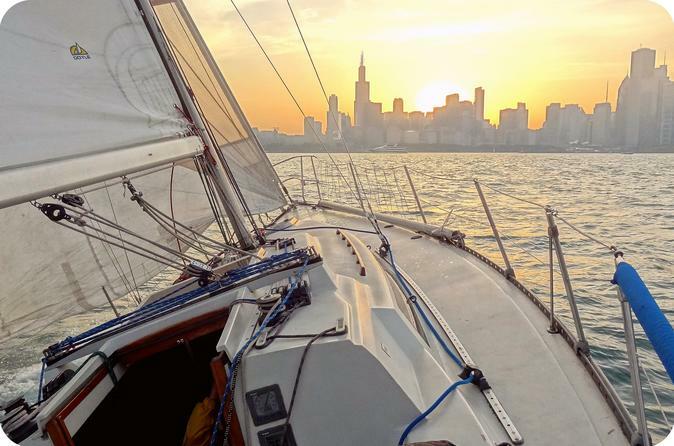 Sailing out of Belmont Harbor in beautiful Lincoln Park, your sailing charter provides breathtaking views of Chicago and a chance to relax in the serenity that only comes from being on the water. A professional captain ensures your day on the water will be safe, exciting and memorable. Our modern sailboat is sturdy, spacious and clean, with all the amenities required for a fantastic day on the water. Charters are BYOB. Guests can bring snacks/food as well. We cannot provide or sell any food/drink. We provide cups, ice, a small fridge, plates, cutlery and paper products. Your sailing charter departs from Belmont Harbor on Chicago's north side. Seabird is located on G dock in Belmont Harbor. If heading southbound on Lake Shore Drive, exit on Irving Park Rd and follow Recreation Drive into the harbor parking lot. If heading northbound on Lake Shore Drive, exit on Recreation Drive and enter the harbor parking lot. DO NOT exit (or allow an Uber/Taxi to exit) at Belmont. The Belmont exit provides access only the south side of the harbor and it will be a very long walk to the boat. Parking is $13 for the day in the park district lot at the harbor. Excursions last approximately 2.5 hours.